﻿ Arcylic/Pan fiber packing with silicone rubber core - China Arcylic/Pan fiber packing with silicone rubber core Supplier,Factory - Cixi Aiflon Sealing Materials Co.,Ltd. 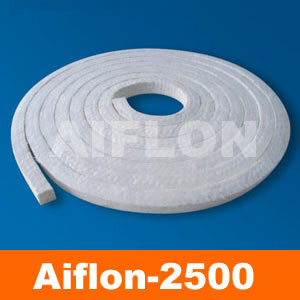 Arcylic/pan fiber packing with silicone rubber core AIFLON 2500SC Arcylic/pan fiber Packing WIth silicone rubber core high strength PAN synthetic fiber pre-impregnated with PTFE, and reimpregnated during square braiding. It has excellent properties of sealing,lubricating and resistance to chemicals. Application:Excellent multi-service for a wide variety of uses throughout a plant.Used in pumps and valves,and can handle most chenicals except strong acid,strong alkali and strong oxidizer. Espcially for the condition of middle-temperature,high-pressure,high-speed,and where contamination is not permitted.